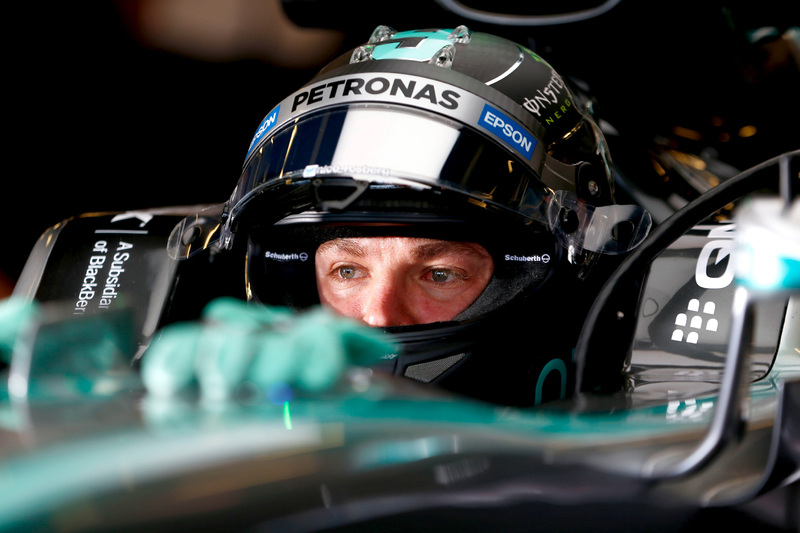 Nico Rosberg has staked his claim for the 2015 British Grand Prix by confidently topping both Friday practice sessions at Silverstone. Rosberg pipped teammate and Lewis Hamilton in free practice one by just 0.070 seconds, but an improved lap in the second practice to the tune of two-tenths of a second was enough to pull himself away from the rest of the field. Hamilton, the overwhelming crowd favourite given his currently dominant machinery, was unable to improve his time in the second session, leaving himself languishing in fourth place and almost half a second behind his teammate. The current championship leader struggled with his car all afternoon, not unlike he did in Austria two weeks ago, and was unable to close the gap even after switching to the grippier medium compound tyres. Ferrari duo Kimi Räikkönen and Sebastian Vettel separated the Mercedes cars, themselves separated by just one hundredth of a second but 0.347 seconds behind Rosberg’s benchmark. The opening stages of second practice were characterised by strong winds, which caused a number of drivers to understeer off the track while using the harder tyre compounds. Felipe Massa had a number of slippery moments before Romain Grosjean beached his car in the gravel 17 minutes into the session, prompting the race director to halt the session for five minutes while the car was recovered. Lotus lost 50 minutes repairing the car — Grosjean polished the dirty black and gold bodywork while he waited — but the Frenchman was able to get 20 minutes of critical running on the medium compound tyre at the end of the session. Grosjean was particularly frustrated with his incident given he did no running at all in free practice one after Lotus gave his car to its reserve driver Jolyon Palmer. McLaren was also suffering around the sweeping Silverstone corners, with Jenson Button complaining of severe suspension bouncing that limited him to just eight time laps in the afternoon after he completed a similarly paltry 10 laps in the morning session. Fernando Alonso fared little better, completing just 16 laps over the course of the day, and enduring a similar off-track excursion to Romain Grosjean, though managed to get the car back onto the road. McLaren is running with an old engine after new components installed in both cars suffered damage during the Austrian Grand Prix, and thus attempted to limit mileage to prolong life expectancy into the race. After Romain Grosjean’s red flag period, drivers started switching to the faster medium compound tyre for long run evaluation, and in the flurry of quick first laps promoted Red Bull Racing’s Daniel Ricciardo and Toro Rosso’s Max Verstappen and Carlos Sainz into the top 10. Daniil Kvyat in the second Red Bull car, however, held onto the fifth-fastest time set with the harder compound tyre after his medium tyre runs yielded overheating rubber. It was a much-needed boost of optimism for the Red Bull senior team after being pummelled by Toro Rosso during free practice one, as has been the case for much of the year. “That’s been a bit of a wake-up call for our team,” said Daniel Ricciardo this week, reflecting on the disparity. On practice pace, Mercedes continues to hold a pace advantage over the rest of the field, but Ferrari will loom large in the Lewis Hamilton’s mirrors if he is unable to rectify his pace deficit to Rosberg in time for qualifying. Elsewhere, the solid chassis rose to the top, with both Red Bull Racing and Toro Rosso looking well placed to score solid points at a circuit that traditionally suits the energy drink company’s cars. McLaren, meanwhile is likely to endure yet another difficult weekend despite aerodynamic upgrades, with the high-power nature of the track deeply disadvantaging its underpowered and unreliable Honda power unit.